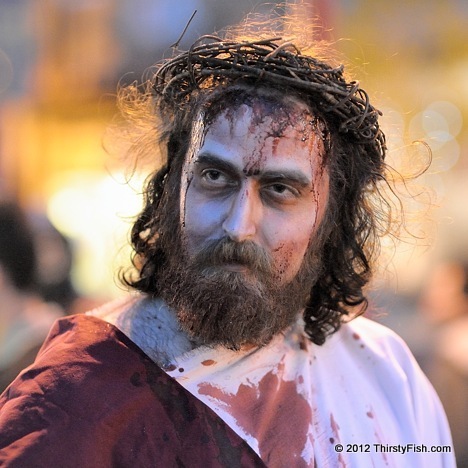 "Zombie Jesus" is the highlight of the annual Philly Zombie Crawl event. The above photo is from the 2012 event. You can see another portrait of Zombie Jesus from last year's event. As with everything, the Zombie Jesus meme has generated some debate on the Internet. Some find it offensive, while others (jokingly) claim that it is justified by Acts 2:24 "But God raised him from the dead, freeing him from the agony of death, because it was impossible for death to keep its hold on him" and John 6:53 "Jesus said to them, 'I tell you the truth, unless you eat the flesh of the Son of Man and drink his blood, you have no life in you'". Some critics even see it is an offensive Atheist conspiracy?